The passing of a female student at Queen’s University, who died from an allergic reaction to a smoothie bought on campus, has triggered concern for other institutions to reinforce their food policies. Dan Dawson, assistant vice-president of Wilfrid Laurier University’s Student Services, noted the university and Aramark Canada, who manages Laurier’s Food Services, are more aware of their responsibilities to operate facilities at an administrative level. Laurier, as well as other post-secondary institutions across the country, are also reinforcing their use of tools and avoidance of cross-contamination. “Everybody was reaching out to each other and saying ‘okay, what are we doing to make sure that our staff are as aware as possible,’” said Dawson. At the school, Dawson explained the concern for students’ allergies starts when the university receives residence applications. “[Applications] indicate whether they have any dietary concerns, and that could be allergies through to intolerances,” he said. Applications that include dietary concerns are sorted into a category. The beginning of the school year saw over 300 residence students out of approximately 3,000 who identified a dietary concern. Students are then placed in the best residence environment to match their allergies and intolerances. Dennis Miller-Robus, culinary operations manager at Food Services, will also sit in with other departments to figure out how they can accommodate those with specific allergies. “We go through station-by-station, specifically for the Dining Hall, and then kind of figure out exactly what works depending on their needs and their allergies,” Miller-Robus said. 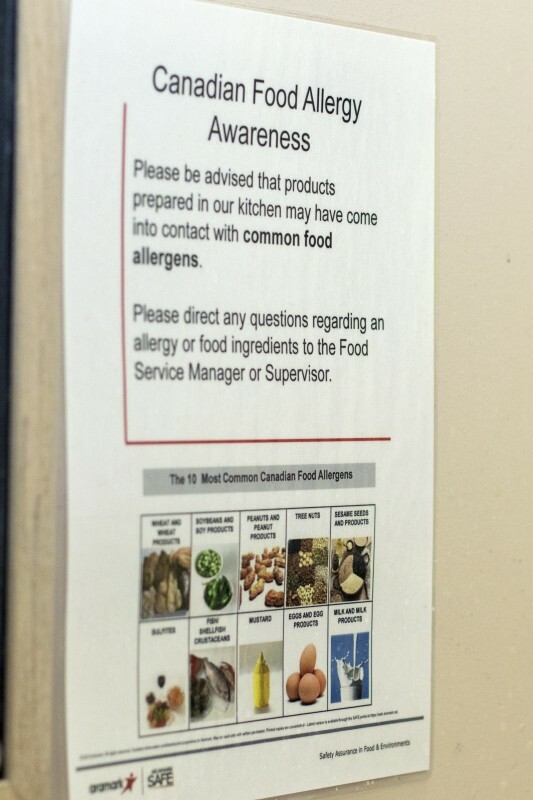 Students with anaphylactic allergies, such as peanut allergies, are put into apartment-style residences with their own kitchens to ensure the food is not prepared in a contaminated area. Outside of campus, customers such as faculty, staff and upper-year students are also taken care of by Laurier’s Food Services. “We’re really not any different than any other restaurant that would exist out in the community,” said Dawson. “Communication is key and on all sides — our side, the students side as well too — that effective communication would really be the key factor here as far as we’re concerned,” said John Thompson, district manager at Aramark Canada. According to Dawson, students are more familiar with their allergies at branded franchises on campus, such as Tim Hortons , Subway and Smoke’s Poutinerie. This doesn’t stop the university from following the franchises’ procedures and menu preparations. “Part of the advantage of having brands on campus is to provide that comfort for the student because they should be able to get a very similar experience here that they would get out on the street,” Dawson explained. The university also encourages students to approach their management team and food services about any dietary concerns or allergies they possess. In his experience as a chef at Laurier, Miller-Robus found students and guests with dietary needs do not feel comfortable communicating with food services, feeling as though it automatically segregates them. “We want everyone to make sure that they feel confident to ask the staff or the front man associate something about gluten, or if there’s a specific allergy that they have to speak up and say something,” said Miller-Robus. “We’ve got a lot of flexibility in how we can accommodate concerns like that, but we’re not mind readers and we don’t know,” said Dawson.